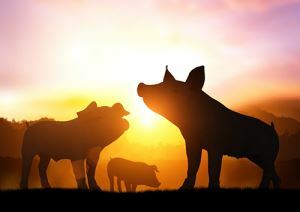 With the met office reporting the likelihood of the heatwave continuing for another month we hear from National Pig Awards Principal Sponsors, ForFarmers, on the impact of the unseasonably hot weather on the cereals market and pig performance, and how nutrition and data play a key role in mitigating the impact for producers and their herd. Hot weather also impacts herd performance. Last year ForFarmers undertook commercial sow trials to assess the impact of ‘seasonality’ on sow performance, underlying fertility and piglet viability and to find solutions for farmers. The study in 2017 revealed that higher average summer temperatures impacted litter performance due to lower sow feed intake and a direct correlation to lower milk yield and sow condition. Milk yield decreased by more than 12%, total litter weights reduced by over 8kg at 26 days, and the number of weaned piglets/sow reduced from 13.21 to 12.17. Reduced feed intake also impacted on sow condition, with the average back fat at weaning dropping some 6% (compared to the situation in the winter). This can have an impact on subsequent litter performance. “Data, from ForFarmers new data analysis tool, Agroscoop (launched at the Pig and Poultry Fair) enables producers to quantify the impacts on performance and take pre-emptive management decisions including feeding times and frequency as well as alter diet specifications to mitigate the impact of lower feed intakes experienced in high summer temperatures. ForFarmers customers on the continent are now seeing much less variation in sow and litter performance during the year delivering more consistent, predictable and efficient performance” comments Beth Austermuhle, who is implementing Agroscoop in the UK. Six months ago ForFarmers launched their new range of Sow Feeds, NOVA, which is underpinned by a range of nutritional innovations. The NOVA diet range is composed of several diets, each balanced to ensure the sow receives the correct level of energy dependent on its feed intake. “By matching the diets to the sow’s individual feed intake we can ensure that her nutritional requirements are fully met and optimum performance achieved. If feed intake is likely to be reduced by increasing temperatures, consideration should be given to moving through the NOVA range to a more nutrient dense diet. Feeding a specific lactation diet can help ensure the sow is able to maximise milk production and hence piglet growth.” says Charlotte Evans, ForFarmers new National Technical Advisor for pigs. While fibre has always been a component in pig diets, it is only recently that ForFarmers has differentiated the different types of fibre and have clarified their uses in pig diets. “We are now able to formulate diets based on the parameters which describe the value of fibre to the pig” comments Miss Evans. “ForFarmers have fully adopted key fibre sources as integral parts of its entire pig feed range. We apply both ‘structural’ and ‘microbial’ fibres in the diets. Structural fibres are known to help with more continuous absorption of nutrients, meaning more constant blood glucose level, while microbial fibre helps develop the structure of the gut which increases feed intake in the lactation period due to the increased size and capacity of the gastro-intestinal tract” concludes Steve Wilson, Pig Nutritionist. Weaning is stressful regardless of climate and other environmental factors, and we know that if mother’s milk production is reduce piglet growth will be negatively impacted. “VIDA piglet feeds contain ingredients that are specifically in the diets to focus on gut health as it is known that good gut health indirectly leads to better feed intake. Feeding a pre-starter diet also encourages early feed intake, which under periods of stress can help maintain the growth curve and health of the piglet.” Katie Stephen’s, ForFarmers Piglet Specialist advises. “Using an energy and vitamin supplement in drinking water, has also been shown to benefit the piglet when access to sufficient energy from milk is compromised and energy deficiency and dehydration is exacerbated by hot weather pre-weaning. However the simplest way of encouraging feed intake and help support hydration is to present feed as a porridge, by adding water on top of piglet diets”. ForFarmers continues to be fully committed to a broad programme of research and development, and extensive trial work has been undertaken to understand more fully the relationship between key nutrients and animal performance. ForFarmers have commissioned new commercial trial facilities which enable the real time collection of individual pig performance, diet formulation and feeding curves, as well as gathering water, management and environmental data to gain unprecedented insights into the nutritional efficiency of individual pigs and genetics. The predictably warmer summer weather doesn’t mean that ‘seasonal’ performance decline has to follow. Through easy to access data analysis tools such as Agroscoop linked to expert nutritional advice, adjusted feeding programmes and diets, ForFarmers has demonstrated how to overcome warm summer weather and through its investment in pioneering research and trial facilities will provide even deeper insights into the relationship, interaction and impact of and between nutrition, genetics, physiology, management and climate, enabling ForFarmers to optimise nutritional efficiency and deliver even more precisely the needs of pigs and producers alike….come rain or shine!